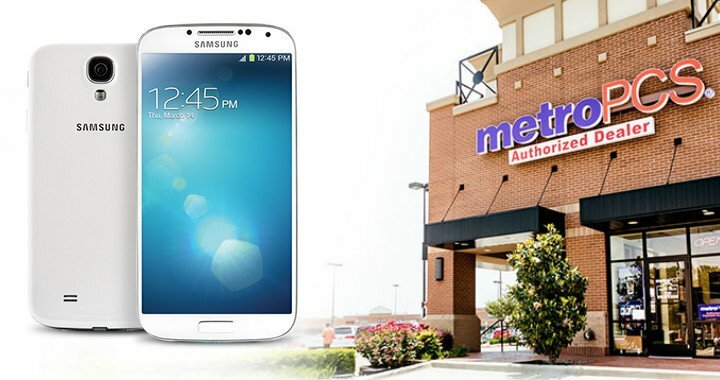 MetroPCS announced on Monday that the Samsung Galaxy S4 is now available in select markets. Priced at $549, the no-contract handset can be paired with rate plans that start as low as $40 per month. It’s the same great hardware and software experience that is found on other carriers and adds to an increasingy more robust smartphone portfolio. DALLAS (July 8, 2013) – With today’s launch of the Samsung Galaxy S® 4, MetroPCS is coupling the ground-breaking features of the latest generation of the Samsung Galaxy-line of smartphones with the exceptional affordability of its unlimited rate plans, and is providing customers with access to a faster nationwide 4G network for one of the best wireless values in town. The Galaxy S 4 opens the door for consumers to experience mobile like never before, and its suite of features ensure that the experience is tailor-made for each individual. The Galaxy S 4 makes an impression with a 5-inch, full HD Super AMOLED™ display with Corning Gorilla Glass® 3.0, a 1.9GHz quad-core processor for effortless multi-tasking and runs the latest version of Android (4.2.2). The 13MP rear and 2MP front cameras capture stunning pictures, 1080P video and turn even the most novice photo-taker into a professional through a variety of innovative camera enhancement features. And the Galaxy S 4’s HSPA+/LTE connectivity offers a blazing-fast Internet experience for quick browsing, multimedia viewing and effortless content uploading. Smart Pause™: Pause a video by looking away from the screen. Air View™: Preview emails, photos in the gallery, or even the stories in Flipboard®. Air Gesture™: Answer a call or skip to the next song by waving your hand in front of the screen. Group Play™: Wirelessly connect multiple Galaxy S 4 phones to play games and share photos and documents. Using the Share Music feature™, users can stay in time and in tune with friends by allowing them to play the same song on multiple phones in sync. The Galaxy S 4 is available in select markets now for $549 plus tax, with additional markets and online availability to be announced soon.